Daily Dumb: Ever get that sinking feeling? 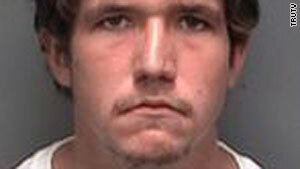 Police say Christopher Schaumburger tried to watery escape but failed when the boat sank. Getaway cars, fleeing on foot -- so old school, right? Well on Monday a suspected burglar in Florida allegedly kicked his escape attempt up a notch by using a cutting-edge mode of transportation: a pedal boat. According to the Pinellas County Sheriff's Office, Christopher Schaumburger attempted to break into several homes in Palm Harbor but after one of the residents gave chase, he stripped down to his underwear, hopped on a pedal boat and tried to go on the lam across Lake Tarpon. Only there was a little problem. The boat was broken and started to take on water. So Schaumburger called 911 and told the sheriff's office of his plight. One witness said, "He was screaming like he was scared to death. I don't think he knew how to swim." When deputies got to Schaumburger, 20, he was allegedly on the phone telling a dispatcher he was trapped in a pedal boat and could not make it to shore. Schaumburger is charged with armed burglary, attempted burglary and aggravated assault.